Discover the beautiful capital of Ukraine, Kiev by reading the travel guide that includes the most up to date travel advice and tips on attractions of the city. Kiev is the capital and the largest city in Ukraine. One of the most populous cities in Europe, the city is the eighth largest city in all of Europe with over 2.8 million inhabitants. As the largest city in Ukraine, Kiev is an important hub for industrial, scientific, and education in Eastern Europe. The city is known for its many higher education institutions and world-famous historical landmarks. Historically, the city is one of the oldest in Europe, with historical artifacts and writings telling of the city dating to the 5th century. During its history, Kiev passed through multiple stages of growth and prosperity as well as decline and obscurity. The city existed as a commercial center as early as the 5th Century, acting as a Slavic settlement on the trade route between Scandinavia and modern Istanbul. The city was seized by many empires over the course of its history, from the Vikings to the Mongols to the Russian empire. It was during the Russian Empire’s control that the city prospered because of an industrial revolution in the late 19th Century. After the creation of the USSR, Kiev became the capital of Ukraine from 1921 onward, and to this day remains the most important city in the country. In 1991, with the fall of the USSR, Ukraine became an independent country and Kiev remained the capital, seeing an influx of Ukrainian migrants from all other regions of the country. Despite the economic troubles occurring because of the fall of the USSR, Kiev became a services and financial hub of Eastern Europe. Kiev is in the north of Ukraine, sitting on the Dnieper River. Getting to the city of Kiev can be completed via air or train. Kiev is served by two international airports: the Boryspil Airport and the smaller Zhulyany Airport. The Boyspil Airport is located about 19 miles from the city center but acts as the major international airport and can handle the large passenger jets that come from long-haul trips. The smaller airport, Zhulyany, is closer to the city (in fact, it is on the southern outskirts of the city) but can only handle smaller, more regional jets. To arrive into Kiev from Continental Europe, taking the train may be easier and more convenient. Rail is actually Kiev’s main mode of travel between cities in Ukraine, as the city’s Kiev Passenger Railway Station is the major long-distance train station. 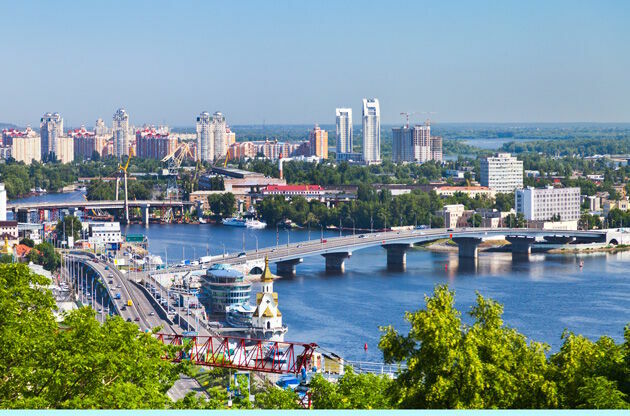 The Kiev Passenger Railway Station is located in the heart of the city and connects with the intracity subway, which is convenient for those arriving into Kiev and looking to get to their hotel or hostel. Kiev is the cultural center of Eastern Europe. In fact, Kiev has over 40 different museums that cater to the interests of visitors. For example, the National Art Museum of Ukraine is one of the largest museums in the world that focuses on Ukrainian art. The National Historical Museum of Ukraine houses many of the historical artifacts that make up the history of Kiev and Ukraine. Also, the Ukrainian National Chernobyl Museum acts as a memorial and historical center surrounding the Chernobyl accident. Other attractions in Kiev include medieval and Russian fortresses throughout the city. In particular, the Kiev Fortress is a 19th Century Russian fortress located in the city that have been restored and act as a museum. For those interested in Eastern Orthodox churches, there are countless churches in the city, including St. Michael’s Golden-Domed Monastery. These churches contain exquisite architecture and art, and are found throughout the city limits. Central Square, also known as Mykhailiv Square, contains the center of government. Within this area are the major buildings of interest such as the Ministry of Foreign Affairs and the School of Diplomacy, which contain more classical Greek-style architecture. In addition to museums, religious centers, and historical sites, the city is home to many professional and amateur football clubs. The largest club, Dynamo Kiev plays in the Ukrainian Premier League along with two other teams from the city. The season runs from Fall to Spring, so when traveling to Kiev taking in a football match is recommended. But for those interested in hockey or basketball, Kiev is home to teams in their respective professional league too. Kiev is the metropolitan heart of Ukraine, and is also the center of wealth for the country. Shopping in Kiev caters to the higher class but also those on budgets. Ukraine uses the Hyrvnia, and Euro or U.S. dollars are highly sought after in Kiev. As such, shopping for goods and converting these currencies to the local currency is favorable for the traveler. Some of the biggest shopping malls in all of Ukraine are located in Kiev, including the Dream Town and Ocean Plaza, and these malls contain many of the higher end shops. However, visitors can also shop along the bazaars and local stores that line the streets close to the city center area. Since the fall of communism, Kiev has become more western-oriented and caters to the western tourist and lifestyle. As such, nightclubs and higher-end restaurants are common throughout the city. Furthermore, there are many luxury hotels that exist throughout the city that cater to the Western European or American traveler. But, the dearth of hotels is a reason businesses can hold meetings and conventions in the city. There are countless tours and excursions available throughout the city, such as museum passes or Dnieper River tours that a business professional can participate in. In particular, the many luxury hotels, nightlife, and restaurants incentivize businesses to hold meetings in the city. This combination of modern living and historical treasures provides many opportunities for business professionals who come to city to participate in their desired congress, conference, symposium, fair or tradeshow in Kiev.